The third Monday in September every year is Respect for the Aged Day in Japan. Meimi immediately wants to know if Takechan has any plans to pay respect her elders. Takechan says sure, but she then complains that there are an awful lot of holidays in Japan for old people. She asks if they didn’t just have a Respect for the Aged Day at the beginning of the month, and Meimi says no, that was Labor Day to pay respects to laborers. Takechan is confused. It turns out that Takechan is confusing the root for ‘rou’ in ‘kinrou,’ or ‘labor’ for the ‘rou’ in ‘roujin,’ or ‘elderly person,’ so she thought that there were two Respect for the Aged Days. Takechan also announces that she has something of a grudge against the holiday because she always noticed that everyone was nicer to her grandparents on Aged Day than they were to her on her birthday and she wants to know why, even for just one day, weren’t they nicer to her. Meimi says that she always gives presents to her grandparents on this day; Takechan applauds her. Takechan then asks which day was more recent, Mother’s Day or Father’s Day. Once Meimi enlightens her, Takechan says that last Mother’s Day her family all did karaoke at home and had melon and that was it. Takechan does not have a good understanding of the calendar year and national holidays. Last week S/mileage Station was transformed into Marotesque Station by Kanyon, and Meimi says that it was a very long recording for her. As you might have guessed by Meimi’s lack of judgment on Takechan for not celebrating any major national holidays, she tries very hard to be pleasant and go along with things on the radio, but it was very difficult the last time. Kanyon wanted to talk for the majority of the show about Berryz Koubou and their impending hiatus and she would often look at Meimi and say, “You know?” or “You remember, right?” when Meimi actually had no idea at all. She tenuously agreed to everything she said to make the show flow better and not make Nyon angry, but she was having a lot of trouble pretending like she knew what was happening. 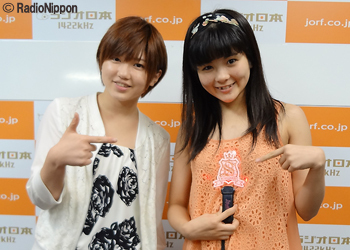 The banner for this radio show is inaccurate today, because it is not S/mileage Station. No, it is Marotesque Station. Kanyon has taken over and as PR Ambassador is going to dedicate the program to Berryz Koubou, so all Berryz wota (since that is still what we’re calling you) should tune in. Also Meimi is here. Kanyon starts of the show by asking Meimi about the summer Hello!Cons, which are coming to an end. Meimi says that something fun about this year’s concerts was that they sang Yume Miru 15, but instead of S/mileage singing it, a group of 15-year-olds sang it. Of course, it isn’t uncommon in H!P to sing songs by another group, far from it. It was strange, though, Meimi says, because she was singing her own group’s song but with people all from different groups. She was also actually the oldest and most senior member out of those singing it, which was another strange feeling, and she says it made her feel just how quickly time has gone by. Kanyon is also startled, saying that she still imagines the 2nd gen members to be new members, but Meimi explains that she’s halfway to the top of the company since she is senior to Juice=Juice and 5 members of Morning Musume. 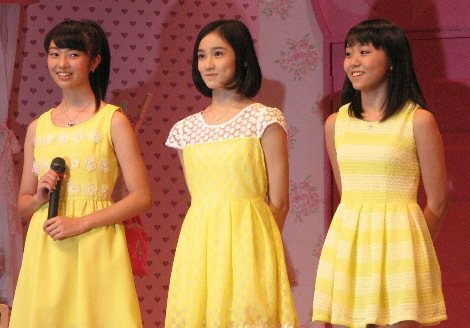 Kanyon did a song with Tsugunaga Momoko, Fukumura Mizuki, and Kumai Yurina as well, BE HAPPY Koi no yajirobee. She starts talking about how happy she is for Hello!Cons because she can sing with Yurina when Meimi starts giggling. Meimi was in the unit for Loving You Too Much that followed Kanyon’s unit so she got to see them a lot at rehearsals and says that as soon as the song started she began messing up. Meimi: Even from the back I got secondhand embarrassment, the dance… like, every time you went out, your legs just started getting wonky. Kanyon: You know, I really could not do that dance. We had the Kenshuusei dance back-up for us, and the teacher still said that I was the worst one. And then I gained weight and never could do it right. Meimi: I felt bad for you. Meimi: You looked like a tomato.